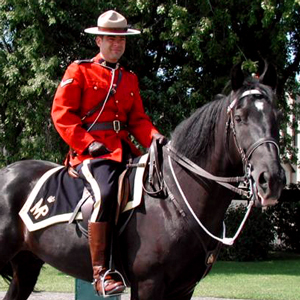 Probably the most recognized image world-wide when people think of the RCMP is a member in Review Order on horseback. Arguably, the second most thought of image is a member in Review Order with his noble German Shepherd at his side. This probably comes thanks to the 1930s radio series “Challenge of the Yukon,” later to become “Sergeant Preston of the Yukon” on radio and television in the 1950s. Sgt. 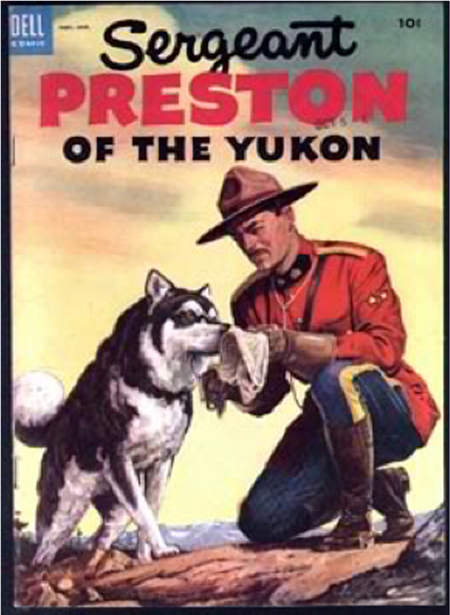 Preston had at his side his trusty side-kick, “Yukon King” his mighty husky, but in fact was an Alaskan Malamute! I served off and on for 18 years in “K” Division and returned many times to visits friends. 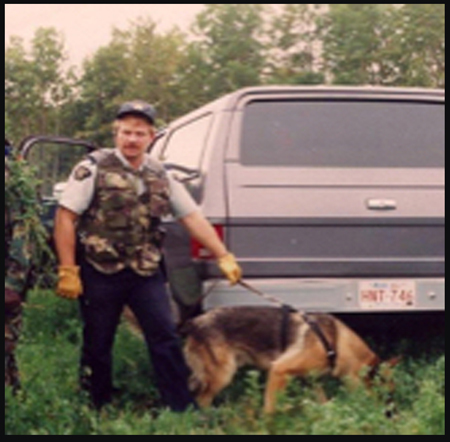 During those travels I had driven by the Force’s Police Dog Service Training Centre, aka “the Kennels”, near Innisfail, visible from the QEII Hwy., many times, but had never stopped in. Recently, while visiting friends in Red Deer, Alberta, we were told that the Police Kennels put on a 45 minute show every Wednesday, from Victoria Day to Labour Day, open to the public. We decided it was a beautiful day in Wild Rose Country; let’s take a drive through the back country to the Kennels. How crowded can it be? As it turned out, very crowded! The kennels are a not so hidden secret on the list of things for tourists to visit. 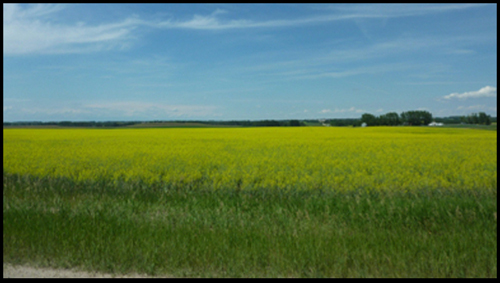 Photograph of the beautiful Canola fields surrounding the RCMP Police Dog Service Training Centre (Source of photo – Ric Hall’s Photo Collection). 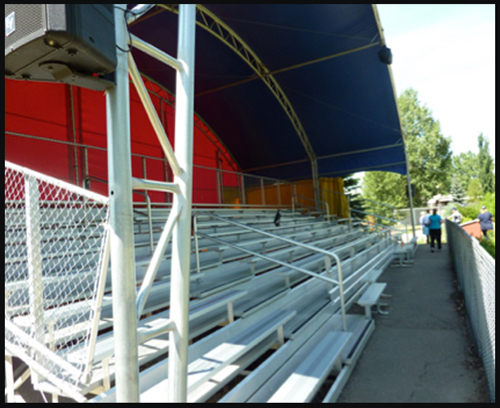 A tent covered set of bleachers is in place for visitors to watch the show put on by members in-training to be dog handlers. It is stressed that the dogs and handlers are in training and there might be a few mistakes…..there were, but the audience loved it! After their demonstrations the handlers participate in a question and answer period from the audience. This prepares the handlers for all those public presentations they will make once they are back in the field. Personally, it hit home when entering the bleachers to see the sign below. I had worked with Corporal Jim Galloway as a member the Edmonton ERT way back in the mid-1970s when part-time ERTs were first established. Jim was still working with the ERT at the time of his death in February of 2004. For those of us who attended his memorial service there were plenty of tears and a lot of laughs recalling his service. 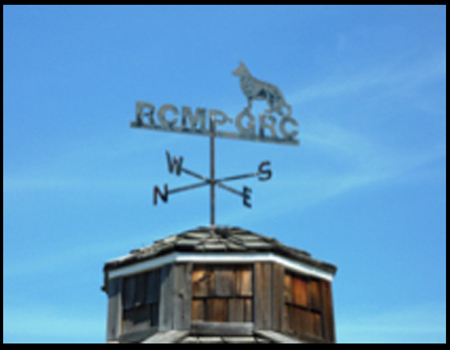 Photograph of a sign at the RCMP Police Service Dog Training Centre (Source of photo – Ric Hall’s Photo Collection). Photograph of the covered stands at the RCMP Police Service Dog Training Centre (Source of photo – Ric Hall’s Photo Collection). 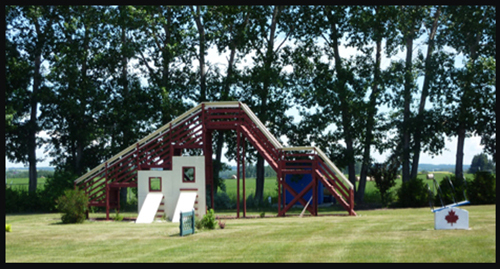 Photograph of dog training simulator at the RCMP Police Service Dog Training Centre (Source of photo – Ric Hall’s Photo Collection). 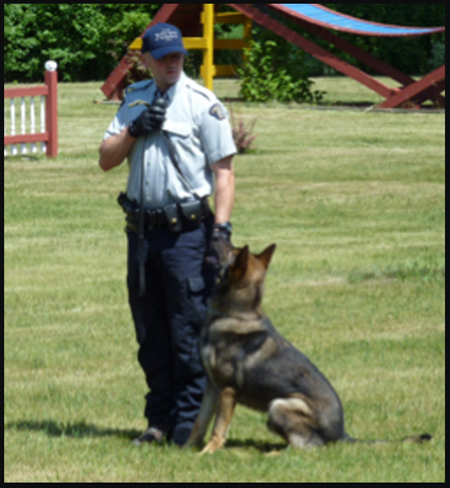 Photograph of a RCMP member with his Police Service Dog in training at the RCMP Police Service Dog Training Centre (Source of photo – Ric Hall’s Photo Collection). 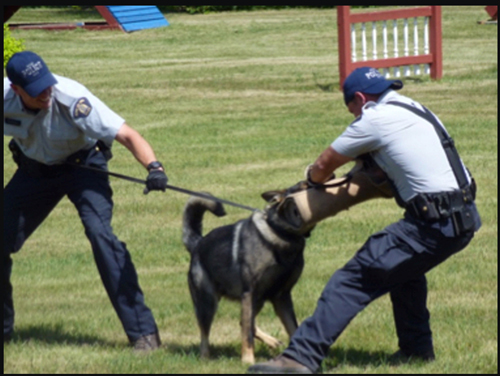 Photograph of: ‘Catch-and-release’ – RCMP members training their Police Service Dog to apprehend a suspect (Source of photo – Ric Hall’s Photo Collection). Photograph of ‘thinking back to your training, here we have a ‘section’ of members and dogs in training – RCMP members and their Police Service Dog marching past (Source of photo – Ric Hall’s Photo Collection). 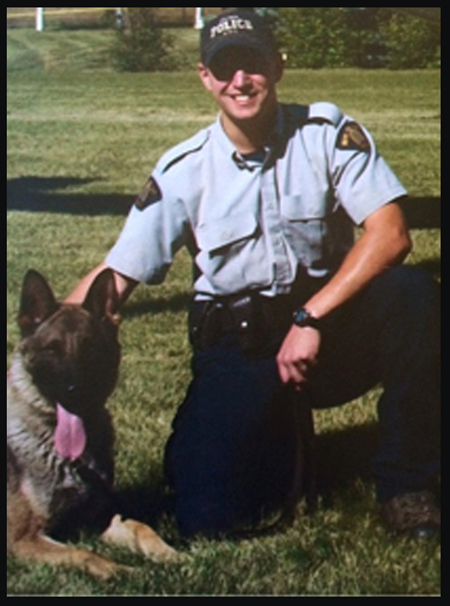 Photograph of a RCMP member with his Police Service Dog (Source of photo – Ric Hall’s Photo Collection). This team has only been together for two days. Their first day together they did a long bonding walk through the back roads leading to the kennels in order to get to know one another. Their ability to work together is quickly credited to the member in the field, who is also an aspiring dog handler, and raised the dog prior to it coming to the kennels to be assigned to a new handler. The original administrative building for the then Police Dog Section and now the Police Dog Service. Photograph of RCMP and Municipal Police dog handlers at the RCMP Police Service Dog Section training centre (Source of photo – John Stolarski’s Photo Collection). 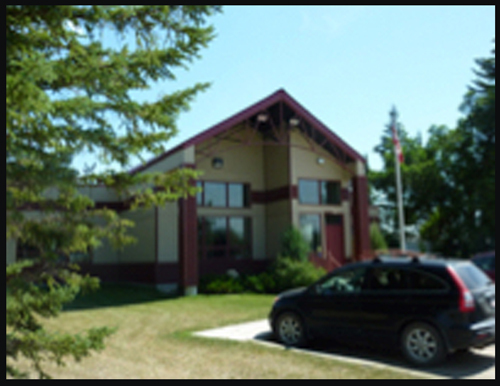 Photograph of the current front of the RCMP Police Service Dog Training Centre (Source of photo – Ric Hall’s Photo Collection). 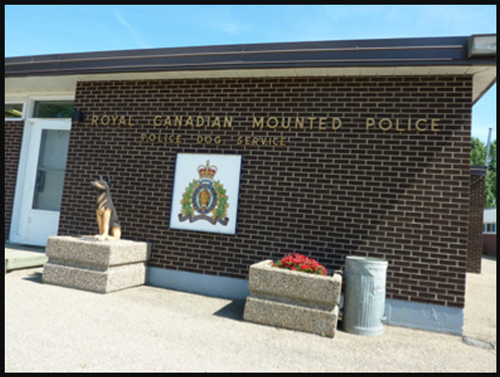 The RCMP Police Dog Service Training Centre (PDSTC) officially opened its new administrative building in June 2007. 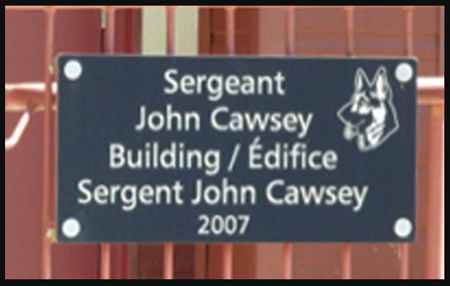 The “Sergeant John Cawsey Building,” is named after the RCMP’s first dog trainer, Reg # 11462, and will further help the RCMP excel in the field of police dog training. 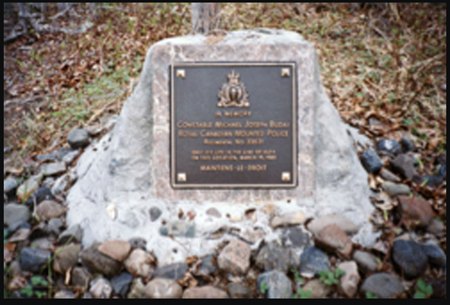 Photograph of the dedication plaque for the building at the RCMP Police Service Dog Training Centre in honour of the late Sergeant John Cawsey (Source of photo – Ric Hall’s Photo Collection). 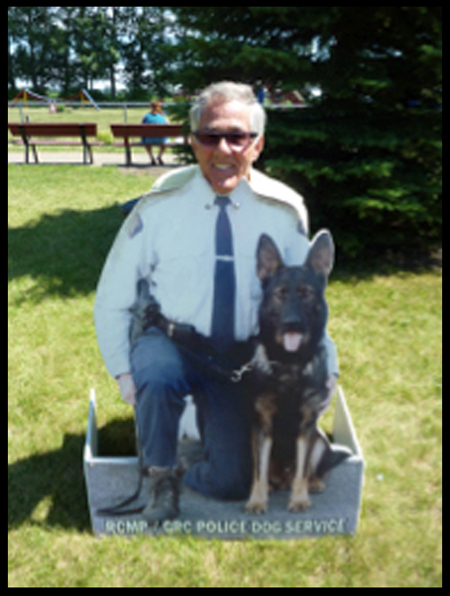 That same day members of police agencies from Canada and the United States who have lost a canine partner, as well as hundred of well-wishers traveled to Innisfail for the unveiling of the Canadian Police Service Dog National Monument on the grounds of the PDSTC. 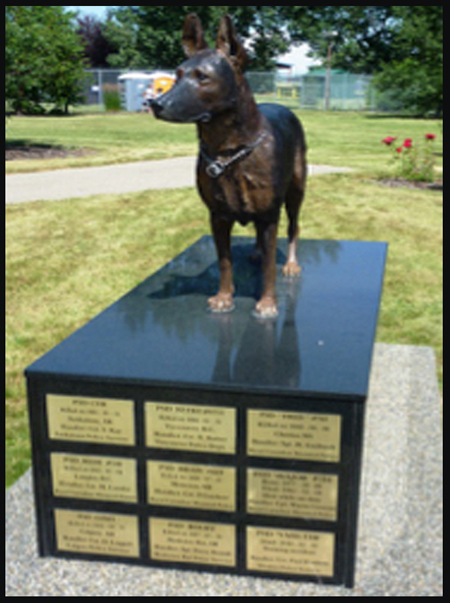 The life-size bronze German shepherd statue by renowned sculptor Diane M. Anderson is a fitting tribute to the 32 police service dogs killed in the line of duty since 1965. 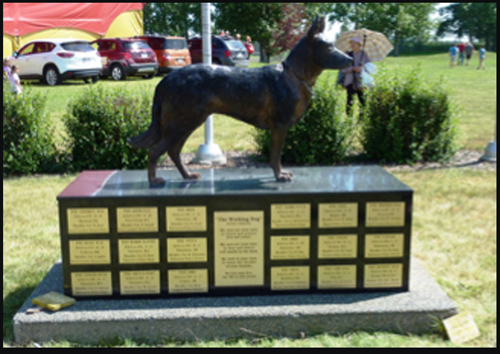 Photograph of the RCMP Police Service Dog Memorial (Source of photo – Ric Hall’s Photo Collection). Willis E. Rhodeniser, Reg. No. 12690 – # 62 on the Honour Roll. On August 25, 1939 Nelson Sammy, shot and killed his wife and her parents on the Indian Reserve near Fort Qu’Appelle, Saskatchewan. RCMP were notified and organized to find Sammy. 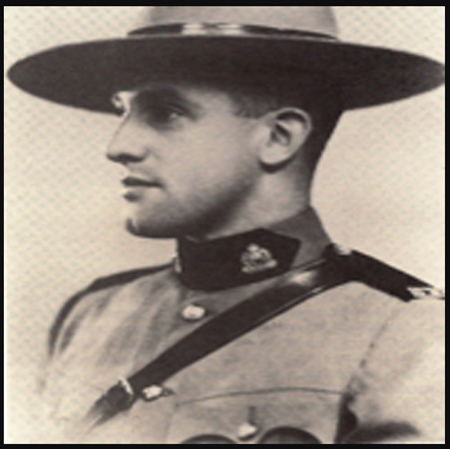 On Aug 26, 1939 RCMP were told that Sammy had been seen near his barn on the Reserve. A number of officers set out to search the area. Cst. Rhodeniser and his police service dog “Tell” were among the searchers. “Tell” picked up Sammy’s scent and followed the trail into the thickly wooded bluff. When “Tell” indicated his quarry, Cst. Rhodeniser ran towards the dog, concerned for his safety. A shot was fired and Cst. 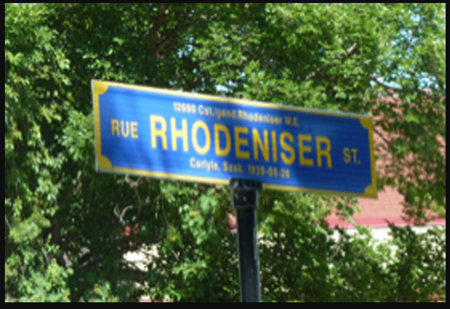 Rhodeniser was struck by a bullet to the chest. Cst. Rhodeniser, as well as other officers, returned fire and Sammy was wounded and captured. Cst. Rhodeniser however, was mortally wounded and died in the bush. “Tell” stayed beside him until his master was taken away by ambulance. Photograph of Constable Willis Rhodeniser (Reg.#12690) (Source of photo – “In The Line of Duty” by Robert Knuckles). Street signs at “Depot, the PDSTC and Canadian Police College have been erected to honour members on the Force’s Honour Roll. Above is the sign at PDSTC in honour of Constable Rhodeniser. Another one of those historical trivia stories is about the spelling of his surname. In the field Willis started spelling his name with an ‘s’ (as in Rhodeniser). The reason for this was because Willis would get his mail from home with his name spelled with a ‘z’ (as in Rhodenizer) and he got into trouble with his supervisors for spelling his name wrong! 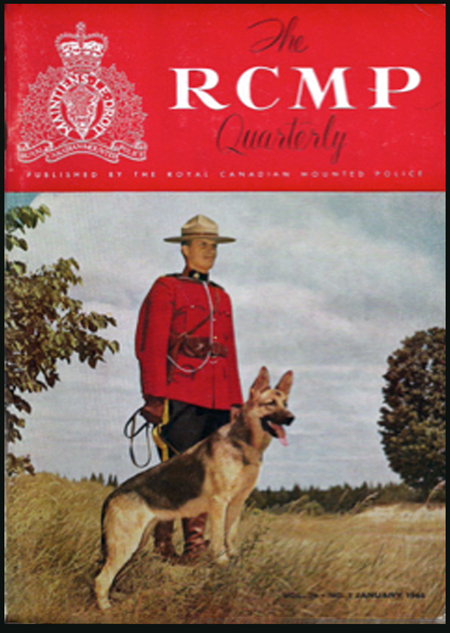 On the street signs at the RCMP Kennels, Innisfail, Canadian Police College and “Depot” and on the Honour Roll, his name is spelled with an ‘s’. You check his home town obituaries his surname is spelt with ‘z’, correctly. Thanks to Joe Healy for that bit of Force trivia. 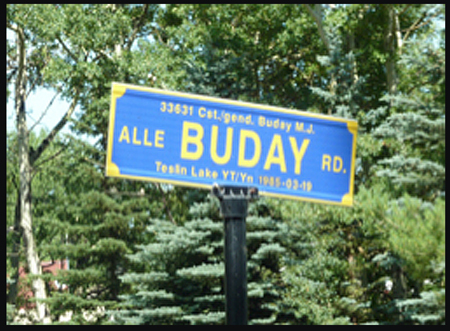 Michael Joseph Buday, Reg. No. 33631 – # 177 on the Honour Roll. On March 18, 1985, a resident of Whitehorse, Yukon, checked his cabin near Teslin Lake and found that it had been ransacked and much of its contents stolen. While at the scene he observed Michael Eugene Oros attempting to flee across the frozen lake with the stolen goods. The victim alerted members of Teslin Detachment, who immediately chartered an aircraft and flew over the area. Spotting Oros on the froze lake service, they made a low pass to confirm his identity, and were shot at by the suspect. The search plane broke off its surveillance; and the assistance of Emergency Response Teams (E.R.T.) from Terrace and Prince Rupert was requested. Oros camped on an island in Teslin Lake overnight; then, in the morning hours of March 19, moved onto the open lake surface. The E.R.T. landed on the lake and deployed in a manner so as to contain Oros. The thief continued trekking parallel to the shoreline; directly toward E.R.T. group. When within 400 yards of these members, he broke from the shoreline and entered the bush. The ERT, including Cst. 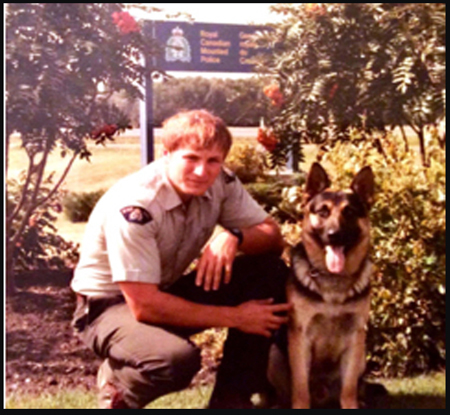 Michael Buday and his police service dog “Trooper”, pursued Oros into the woods. Oros stealthily circled Cst. Buday in the bush, and shot him from behind, killing him instantly. The remaining ERT members returned the fire, and Oros was killed. James (Jim) Wilbert Gregson Galloway, Reg. No. 27332 – Dogs handled by Cpl. Galloway include Klia, Shep, Max, Danko, and Cito. # 203 on the Honour Roll. Cpl. Galloway has provided exemplary service to the Police Service Dog Section, with his leadership, tenacity, strong work ethics and outstanding dedication. He also held the role of Program Manager, for “K” Division. Cpl. 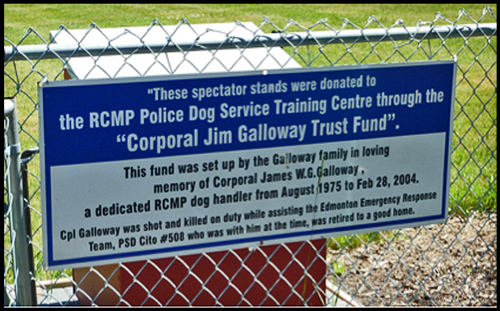 Galloway managed the RCMP Civilian Search and Rescue Service Dog Program in Alberta. He has been an active member and team coordinator for Northern Alberta Wilderness Search and Rescue, instrumental in training and certifying to an approved standard, numerous civilian search and rescue dog teams in Alberta. Cpl. Galloway’s consistent, thorough, and professional approach to any task has been his trademark; qualities he has imparted on those who worked alongside of him. Additionally, Cpl. Galloway served as a member of the Edmonton Emergency Response Team (ERT) and tactical teams. He was killed in the line of duty on 2004 February 28, while involved in an ERT call, attempting to apprehend a mentally unstable individual during an armed stand-off. Last September at the annual Memorial Parade at “Depot” the Force once again honoured its fallen members. 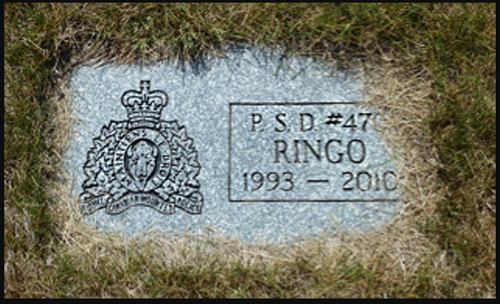 The names of the three members killed at Moncton, NB, in 2014, in the line of duty were added to the Honour Roll. One of those members was a police dog handler. 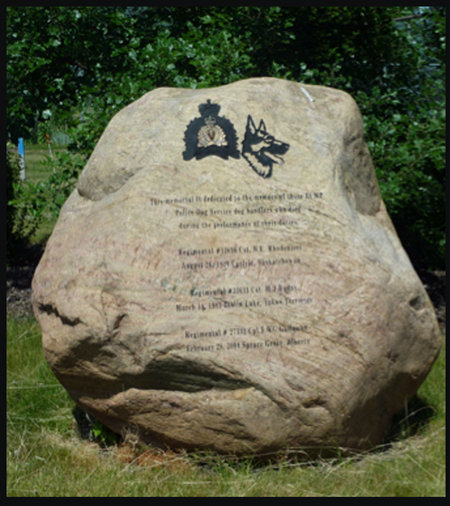 Sadly, Constable David Ross, Reg # 54868, name was added not only to the Honour Roll as # 234, but will be added to the Memorial at the Kennels and in due course a street sign will also be added. 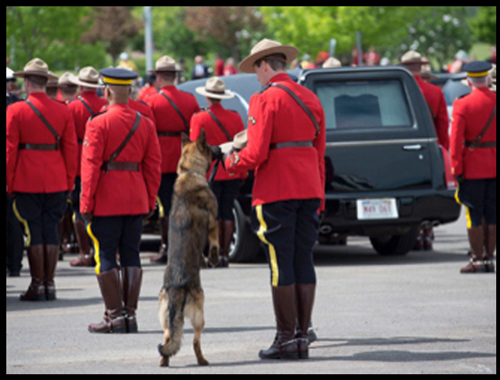 Photograph: “No one will forget this poignant picture of “Danny” having one last smell of his handler’s Stentson” – taken at the funeral of Constable Dave Ross’s RCMP Regimental funeral. For all members of the Force, wherever they are stationed in Canada, who aspires to be Police Dog handlers, for them all roads lead to the Police Dog Service Training Centre, Innifail, Alberta. Many members of the Force wish to be members of the Police Dog Service, few make it. My travelling companion on our visit to the Kennels was my long-time friend retired Cpl. Guy Gibson, Reg # 24178. He was one of those guys back in the day that had the fleeting thought of trying to become a dog handler, he never made it. But for a brief moment on a hot day in July 2015 he had a small taste of what it could have been. 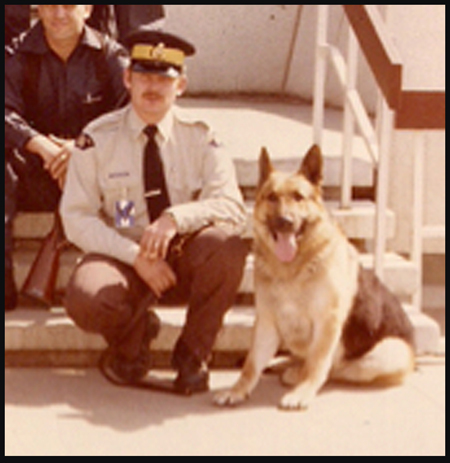 Photograph of Rcmp Veteran Guy Gibson (Reg.#24178) taken at the RCMP Police Service Dog Training Centre at Innisfail Alberta (Source of photo – Ric Hall’s Photo Collection). 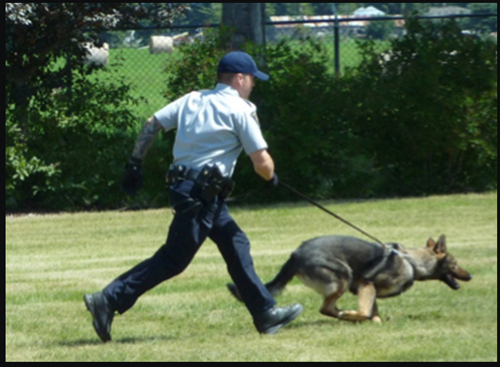 For more information on the RCMP Police Dog Service Training Centre, check out their webpage here.